It was a dream of a lifetime. 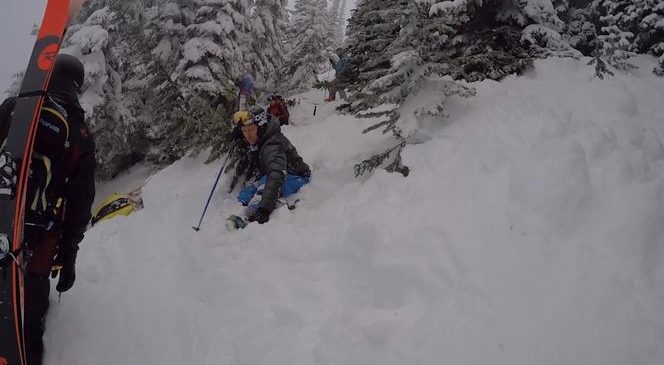 Twelve friends on a snowcat ski trip in the British Columbia backcountry when all of a sudden the dream nearly turned tragic as they were hit by an avalanche. The group had just gathered off the cat while touring with two Big Red Cats guides when the avalanche occurred. The group told reporters their avalanche recovery training came in handy as they recovered their friends. Creighton Green, said he remembered hearing someone yell “Avalanche!,” according to KSL TV. The wall of snow stretched 75 yards and swept some of the men off their feet and tumbling into trees. Thankfully they were all wearing locating beacons as they quickly snapped into action. About after 15 minutes everybody was located including one man who described getting twisted around a tree like a pretzel. Another member of the group was unconscious, but said to be recovering at an area hospital. Here them tell the stories in their own words at KSL TV.